Washington Black (Paperback) | The working bookstore for the reading class. Esi Edugyan's new novel, Washington Black, is a terrifying, magical, sprawling fable which reprises themes from her Booker prize short-listed debut novel Half Blood Blues. The story begins with the horrors of slave life on a sugar cane plantation in Barbados told from the point of view of an eleven year old slave boy. These beginning chapters are the most powerful and beautifully written of the entire novel, yet the story then unfolds in a series of tableaus which defy the imagination and exert a hypnotic effect on the reader. Our boy protagonist escapes the plantation on a hot-air balloon, travels to the Arctic, spends years in Nova Scotia, and finally ends in England and Morocco. His journey is a fable by any standard, yet the issues it raises via his interactions with the white world, populated as it is with both well-meaning men and moral monsters, yield deep psychological insights which will resonate with anyone concerned about the crisis in race relations in today's world. 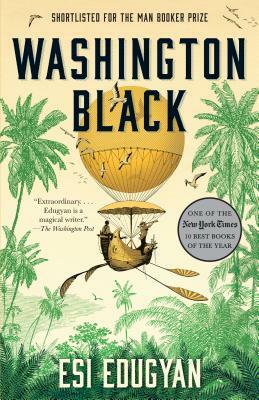 The narrative voice which Edugyan gives to Washington Black, or "Wash" as he is known by others, is a first-rate example of her immersive, entrancing literary powers, and the way it changes as the boy grows into a man capable of transcending his victimhood rings true and is deeply moving. I loved this book and savored it over several sittings. The final scene is one of ineffable beauty, and will be debated for some time to come. It's worth the trip!